It takes a lot of time and patience to build up a great online reputation for you and your business. In the beginning it’s especially difficult to prove to others that you own a worthwhile business. This is because many consumers judge a business by the quality of its online reviews. Studies have even been conducted showing that independent reviews are effective when it comes to building up your trust with your client base. There are even studies showing that people trust independent reviews almost as much as they trust a personal recommendation from a friend. While it’s easy to understand the benefits of having clients leave reviews for your business, getting them to do so is an incredibly challenging process. In fact, you’ll probably find that most consumers are more likely to leave you a review when they’re unhappy with your business instead of when they’re happy with it. 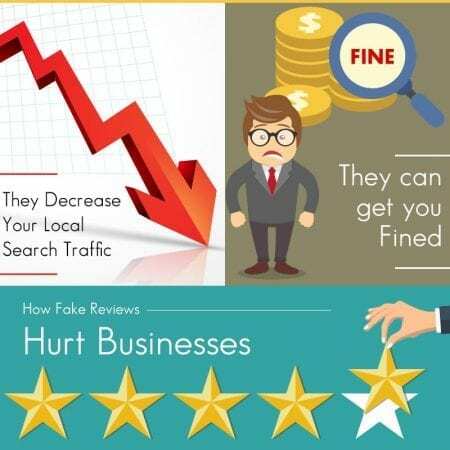 This has led many businesses to choose to outsource fake reviews to improve their online ratings. Initially, this may seem like a good idea, but eventually this will have a negative impact on your business in several different ways. Typically, fake reviews are outsourced overseas to people who don’t speak good English and who also don’t put much thought into the work they’re doing. These are things consumers can easily spot today. When they do, they lose trust in any business that engages in such practices, especially if your page is full of these types of reviews. Google bases its entire business on data. As such, they’ve become very proficient when it comes to tracking and predicting trends – including fake reviews, which simply seem unnatural to them. When they do so they’ll penalize your SEO because they believe you’re trying to game the system. This means you’re much less likely to rank for relevant local search terms so your website will receive less traffic, which will result in a steep drop in your earnings. In the past, regulators would turn a blind eye to fake reviews, but more recently they’ve stopped doing so. This is because reviews are now taking a prominent part in the digital marketing landscape. Consumers are looking for reviews they can trust to help them make decisions about what products and services they should buy. This has led regulators to take steps to put an end to any online marketing deception they find. In fact, some New York regulators fined companies $350,000 for posting deceptive reviews on popular websites like Google, Yelp, and Facebook. While this is an isolated incident now, you’ll surely see more of it in the future as these reviews do effect SEO. Even if you manage to avoid all these repercussions, your reviews will still look too good to be true. After all, almost every online business has at least a few negative comments circulating the internet about them. If you don’t have any of these, but instead your page is filled with nothing but glowing 5-star reviews, eventually someone is going to catch on to the fact that you’re gaming the system with your fake reviews. Instead of having fake reviews written for you, spend some time and money on SEO instead. Doing so can truly profit your business, especially when you’re receiving help from the Local SEO Tampa Company. With several years of experience behind them, you’ll see that they can help you legitimately boost your traffic, which is why you need to get them to help you starting today.